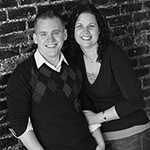 Justin + Sarah are an incredible couple with an infectious sense of humor and quick smiles. Their story is a tale of college romance, low budget dating, awkward moments, and a destiny to be together. I greatly look forward to their big day and sharing it with all of their friends and family! NATHAN!!!!!!!!!! OMG AAAAAAMAZINGGG!!!!!!! You are so good!!!!!!! We LOVE it!!!! This is so good!!! Our plan is to show this at our rehearsal dinner :)! You are awesome!